NEW YORK�(CNNMoney) -- Stocks sold off sharply Monday and gold prices rose, as worries about Europe's debt crisis and uncertainty over the U.S. debt ceiling kept investors on edge. 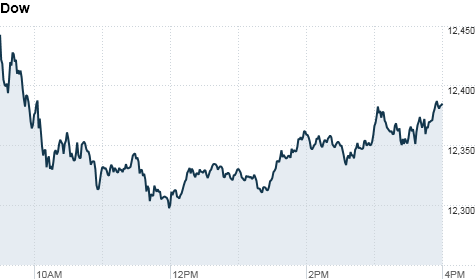 The Dow Jones industrial average (INDU) sank 95 points, or 0.7%, to end at 12,385. The S&P 500 (SPX) fell 11 points, or 0.8%, to 1,305. The Nasdaq Composite (COMP) slid 25 points, or 0.8%, to 2,765. U.S. stocks took their cues from Europe after results from the latest bank stress tests fanned concerns about the challenges facing the European Union as it struggles to resolve the debt crisis in Greece. Those worries weighed on shares of U.S. financial institutions, with Bank of America (BAC, Fortune 500), Goldman Sachs (GS, Fortune 500) and Morgan Stanley (MS, Fortune 500) all trading at their lowest levels in over two years. American Express (AXP, Fortune 500), Citigroup (C, Fortune 500), JPMorgan (JPM, Fortune 500) and Travelers (TRV, Fortune 500) were also under pressure. But the declines were broad, with all 30 Dow components in the red. Industrial names Alcoa (AA, Fortune 500), Caterpillar (CAT, Fortune 500) and Boeing (BA, Fortune 500) were among the hardest hit. In Washington, policy makers made little progress over the weekend on a budget deal to raise the nation's debt ceiling. Early Monday, rating agency Moody's went so far as to suggest the debt ceiling itself should be eliminated to bring greater stability and avoid "periodic uncertainty." "The debt worries both here and abroad continue to weigh on the markets," said Peter Cardillo, chief market economist for Avalon Partners. "There is just too much uncertainty." That uncertainty drove investors to gold, which ended at a record high of $1,602.40 an ounce. Investors see gold as the best place to park their money when there's economic or political uncertainty. Silver prices also moved higher, rising above $40 an ounce for the first time since early May. The U.S. dollar gained versus the euro and oil prices fell more than 2%. The global debt concerns were overshadowing corporate reports, which have been generally better than expected, said Kate Warne, chief investment strategist with Edward Jones. "I do think investors have been overlooking the solid performance of companies and paying far more attention to the headlines about governments having problems paying their bills," she said. Analysts at Capital IQ expect second-quarter earnings for the companies in the S&P 500 to be up 15% versus the same period last year. Of the 43 companies in the index that have reported earnings so far, 30 have come in better than expected, according to Capital IQ. Stocks posted solid gains Friday, following better-than-expected corporate earnings. Companies: In total, more than a fifth of the S&P 500 and half of the 30-member Dow Jones industrial average will report their results this week. After the closing bell, IBM (IBM, Fortune 500) reported second-quarter earnings that beat analysts' expectations. The company said earnings rose 18% to $3.09 a share, versus a forecasted $3.03 a share profit. Cisco (CSCO, Fortune 500) announced plans to cut its global workforce by 6,500 employees, including some early retirements. The move is part of a plan to save the company $1 billion a year. Earlier, Halliburton (HAL, Fortune 500) reported better-than-expected net income of $739 million, or 80 cents per share. The oil services company also beat revenue forecasts. Shares edged slightly higher. Citing strong demand, toymaker Hasbro (HAS) reported a 33% jump in net income to $58.1 million, or 42 cents per share. Despite the strong report, shares fell 4.7%. Shares of WebMD Health Group (WBMD) plunged more than 30% after the online healthcare information site slashed its sales and earnings guidance for 2011. Fallout from a phone hacking scandal continued to wrack News Corp. (NWSA, Fortune 500) Authorities arrested and then released former News of the World editor Rebekah Brooks over the weekend. News Corp.'s stock lost 4.5%. Bonds: The price on the benchmark 10-year U.S. Treasury rose early Monday, pushing the yield down to 2.93% from 2.95% late Friday. World markets: Britain's FTSE 100 shed 1.5%, the DAX in Germany and France's CAC 40 both lost 1.7%. Shares of Nokia (NOK), Alcatel-Lucent (ALU), Ericsson (ERIC), Bank of Ireland (IRE) and the National Bank of Greece (NBG) were among European ADRs trading lower in the early going as investors worried about how widespread Europe's problems were. Asian markets ended the session lower. The Shanghai Composite dropped 0.1%, the Hang Seng in Hong Kong lost 0.3%. Japan's Nikkei was closed for a holiday.